Chrome mobile web browser for Android gets a new offline access features that enables you save web pages, music and videos for use when you are off the internet. Google announced this introductions as "a series of improvements to make it easier to save content for offline access, as well as quickly find the pages you had already saved." To download a web page previously, you would open Chrome’s menu in the top-right of the browser, then tap the “save” icon that’s located next to the star for bookmarking the site. You could then see all the content you had saved for offline access by tapping on “Downloads” from this same menu. Now, Google is adding more ways to save content, including a way to long press on a link the way you do when you want to open up a page in a new tab. The option to “Download Link” will appear on the pop-up screen you see after your press, below the options to open the page in a new tab or incognito tab. Google says this long press action will also work on its article suggestions on its New Tab page. This New Tab page will also include the articles you’ve already downloaded, which will be flagged with an offline badge. This addition makes Chrome feel a little more like Instapaper or Pocket, services that both also provide users with a list of saved articles that you can read while offline. For those who only occasionally save articles for offline reading, Chrome could potentially take place of these services, as well as serve as an alternative to bookmarking web pages you want to catch up on later. 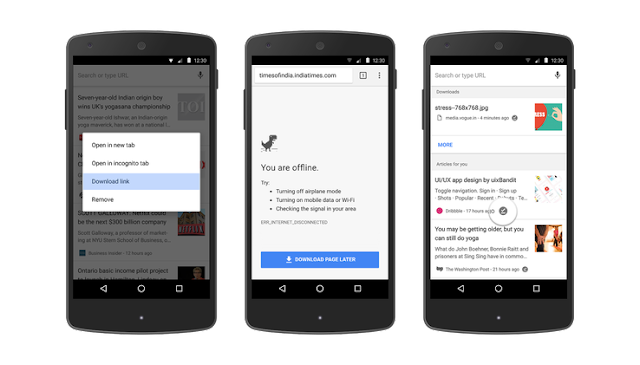 Because it’s built into the browser, Chrome’s offline saving feature could see wider adoption among more casual readers who wouldn’t have otherwise downloaded a standalone app for saving articles. Google notes that having a list of articles to read could also be useful for times when you’ve stumbled into a dead patch on your network, or are out of data for the month on your phone plan. Another new feature makes the download button available in more places. If you’re browsing offline, and click through to a dead web page you hadn’t downloaded, you’ll now notice a new blue button at the bottom of the screen that reads “Download Page Later.” By tapping this, Chrome will automatically download the content on that page when you again have an internet connection. Google says Chrome users download more than 45 million web pages every week, which indicates some level of demand for offline reading functionality. Download the updated updated version of Chrome on Android the new offline features.